Even when I was WITH Orange they could never get it right – and now that I’ve LEFT them they STILL can’t get it right. Until recently times I’ve had an Orange mobile phone since, oh, well, last century. I’ve never had a signal in Wark but we live in home and from time to time I’ve written to Orange to try to push them along to improve the signal. Along the way their customer service has been attrocious to say the least and recently it’s been just too much. 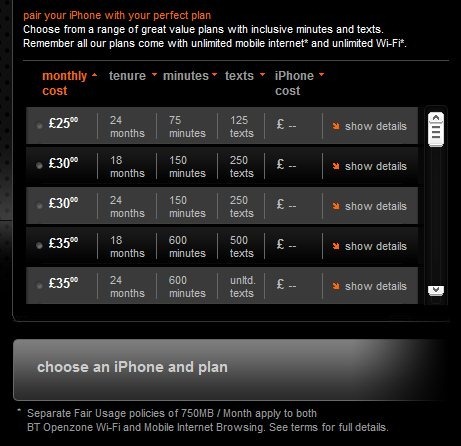 I’d had enough by mid-2011 and due to that and continued utter lack of signal at my home and no plans to get it, I finally managed to get Orange to agree that I could scrap the mobile contract and go elsewhere – this was in May 2011. This agreement was put on my record. I rang them up and confirmed I wanted to leave Orange – and asked what the procedure was. I was to put my phone in an envelope, send it off to them and I’d then get a final partial-month bill – and the info I needed to transfer my number elsewhere. I am SO glad I dumped these losers. Oh yes, I went to mobile company THREE and yes, their website works, NO they don’t have a “fair use” policy – and they give you a free premium subscription to Spotify… and their 3G works in every rural area I’ve been to up to how – Orange say they have better COVERAGE – but I think I’m safe in saying that THREE have better 3G coverage. I can play music almost anywhere I go as it streams it off the web, be that Internet radio or Spotify… what a different world…. Check out this catalogue of errors…..
Update 5th September 2011 : I’ve just returned from holiday to find a bill from Orange (I never did hear any more from them otherwise). No, it’s not for the outstanding £36 – but for a whopping £114.68 AND they’re threatening to "disconnect" the service – that should be good for a laugh as it has been disconnected since June (07773 819894 – discontinued) – it’s as if they have no knowledge AT ALL of the contract ending. I spoke to someone on the phone today and they have records of me ringing in… but could not progress as the guy I spoke to may be on another shift – or some such excuse – so I’ve written off to them to point out they have the phone and the contract’s been dead since June… Amazing. Update 14th October 2011: 2 days after Orange sent a bill for the wrong amount – they sent off a THREATING LETTER. This one says they’ve contacted me a number of times “ERM NO!”. Apparently if I’m still within my contract (which they KNOW I’m not) I’ll be liable for monthly service plan charges. What is it about this lot that make me think of a large office of people walking in straight lines, banging their heads against walls then bouncing off in search of another wall. Dealing with Orange has been this dis-organised since I bought my first Nokia Smartphone from them last century when we lived in Newcastle…thinking about it – there was no signal there, either. Still – I’ll never have to do it again! Update 30th October 2011: I’ve returned from a short break – this time to find a letter from Moorcroft Debt Recovery Limited who sent a particularly obnoxious for £148.27 (remembering I owed Orange £36 and I had already send them a cheque on 14th October to sort this once and for all despite not having an invoice for it). I rang Orange (amazingly this simple cancellation has now been going on for 5 months) – the operator put me on hold for his manager, his manager put me on hold for debt recovery – but their phone isn’t working today and so I have been told by the manager, a lady, that this is in NO WAY MY FAULT (you don’t say), that she’s emailed the dept recovery agency to SCRAP this and someone will ring be back tomorrow between 10.30am and 11.30am. I was just about to thank her and put the phone down when she started talking about UPGRADES… I very CAREFULLY explained this was nothing to do with upgrades but due to a cancellation because Orange never has and never will provide a signal where I live. It is hard to believe that this company actually has computers and keeps records. 26th October a bill arrived for £148.27 and a load of threats from Moorcroft debt recovery Ltd – and a promise from Orange that none of this is my fault. Meanwhile they seem unaware I’ve already sent a cheque for the REAL outstanding amount together with a long cover note including this blog. Update 17th November 2011: I checked with Moorcroft and sure enough they cancelled the order against me – and they don’t do anything with credit records – one down, one to go. The latest bill from Orange turned up, no cover letter, nothing – but THIS TIME they OWE ME several pence. Well, I suppose that’s a step forward, perhaps I should get an agency to harass them for non-payment… but importantly no confirmation that they’ve set the credit record right – and no promised letter to say we’re all done – which means I could just as easily get another bill from them at any point setting us back to square one. I guess another letter is needed to try to wrap this up, again. Meanwhile my new THREE service continues to work a treat, they’re not immune to incompetence – but at a much lower level. I’ve now had several attempts to stop them sending me text messages every 5 minutes when I’m overseas – their Indian call centre promised me this would never happen again but a text confirmed that the operator had no authority to say that and they can’t actually stop them – well, honesty is a virtue I suppose. Check this out iPhone pricing on the ORANGE site. See at the top where it says “UNLIMITED MOBILE INTERNET and UNLIMITED WIFI”?? I could get a dictionary out for the meaning of “unlimited” – but I think you get the point. ORANGE WHO ARE YOU TRYING TO KID WITH THIS CRAP???? I contacted Orange on this subject and on 29/3/2010, Emma of online services confirmed my worse nightmare. Yes, but that’s EXCLUSIVELY – if you have 5 hours of video downloaded from YouTube, THAT’S YOUR LOT. Now think about this – just recently TED released a mobile version of their videos, there’s a FREEVIEW site which offers Freeview on mobile. More and more of us try to make use of our travel time by catching up with news. There are a THOUSAND REASONS why 750 meg a month is not good enough for enthusiasts today and why it won’t be good enough for the rest tomorrow. And it is OUT AND OUT DECEITFUL to use the word “unlimited” then add a caveat that it’s not “unlimited”. I don’t know what’s WORSE – that or “up to 8 meg broadband” when 8 meg is the BEST you’ll ever get on a good day, with the wind – and while carefully avoiding mentioning that ADSL means that for applications such as video conferencing, it’s the upload, not the download speed that is relevant. It’s about time the government got to grips with the SLIGHT OF HAND that the large modern communications companies are using when dealing with the public. The future’s grim – the future’s Orange. Want to hear the audio version of this? Head on over to AudioBoo.